Over the last few months, you may have seen your friends on Facebook posting lists of things for which they are thankful or grateful. You may have even participated. 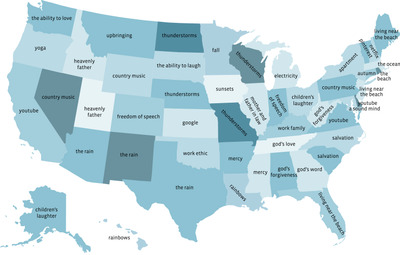 The analytics team at Facebook recently looked at those posts to see what people around the US are most thankful for. They came up with some pretty interesting trends and fascinating maps showing the most distinctive topics by state. One note: Facebook found that over 90% of the people who participated in this challenge were women. Overall, “friends” were the thing for which people around the US were most thankful, followed by family, health, “family and friends,” and their jobs. Broken down by the most distinctive things for which people are thankful by state, things get a little more interesting. Weather was popular in the southwest and midwest. People from both Maine and Florida were thankful they lived in close proximity to the beach. You can see more about the trends and read about the methodology here.